If you use Windows 10 Pro, you are fortunate to read this article cause it will introduce you how to create Windows 10 Pro reference computer and deploy the image. A user told us that he has several computers, one is running Windows 10 Pro, and he needs to set one up as a reference computer and then deploy that image to the rest of them. But the biggest problem is how to create Windows 10 Pro reference computer and deploy the image to other computers? To create Windows 10 Pro reference computer and deploy the image, here we highly recommend you AOMEI Backupper, which can help you create Windows 10 image and store the image to the network, or share on NAS. Besides, you can use AOMEI Backupper to create bootable media, so that you can deploy the image to another computer or different hardware. However, if you want to deploy the Windows 10 Pro reference image to multiple computers, the AOMEI Image Deploy would help a lot. AOMEI Image Deploy is such a wonderful software, which supports deploy image to multiple computers at the same time. It is very suitable for users who want to deploy Windows 10/8/7 to computers in batch. Before you doing, there are somethings you need to prepare. > Install and launch AOMEI Backupper on your Windows 10 Pro, then, click Disk Backupor System Backup to create an image of Windows 10 Pro reference computer. Then, determine a server computer and left the rest computers as the client computers. Make sure all the server computer and client computers are on the same network segment of the same LAN. > Then, you need confirm that the network adapter in the client computer supports PXE boot. > Start all computers, enter into BIOS, set the network boot as the first boot device. 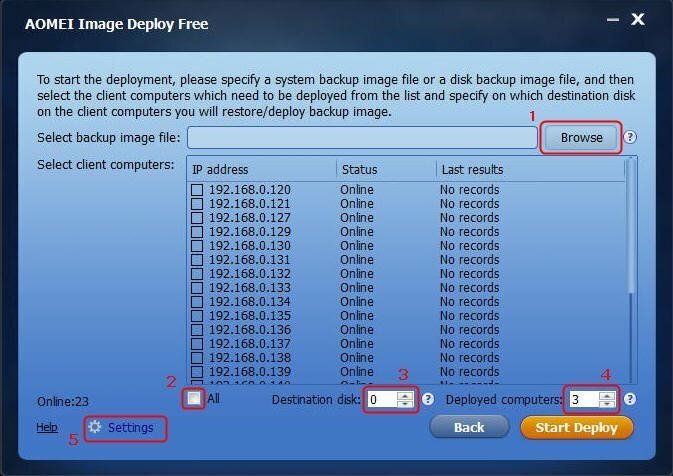 > Confirm that the sequence number of the destination disks for image deployment on the client computers are same. > Confirm the Windows RE in the server computer is complete. Otherwise, you need to download Windows AIK/ADK. 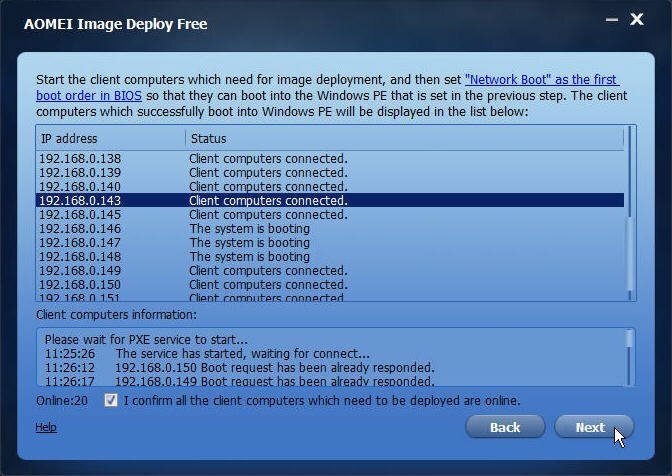 Then, you can start to deploy Windows 10 image to those client computers. Step1. Install and launch AOMEI Image Deploy. Create bootable WinPE ISO file manually or automatically. Tick the box beforeEnable SHCP if there is no DHCP server in the LAN. Step3. Confirm that all client computers are connected. Step4. Browse and select the image you are going to deploy. Setting all things ready, and click Start Deploy to execute the task. Step5. In the last, you can select whether to shut down or restart the client computers after completion of the deployment. This way is more suitable for deploy Windows 10 image to multiple computers. 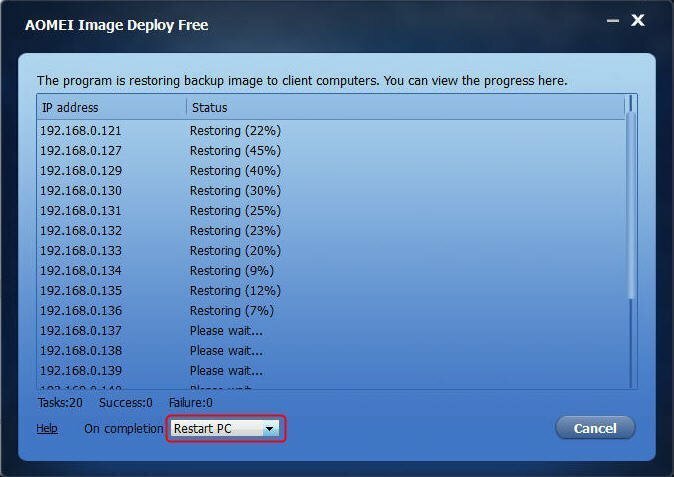 But if you only want to deploy Windows 10 image to a computer, you can use AOMEI Backupper to restore Windows 10 system image backup.